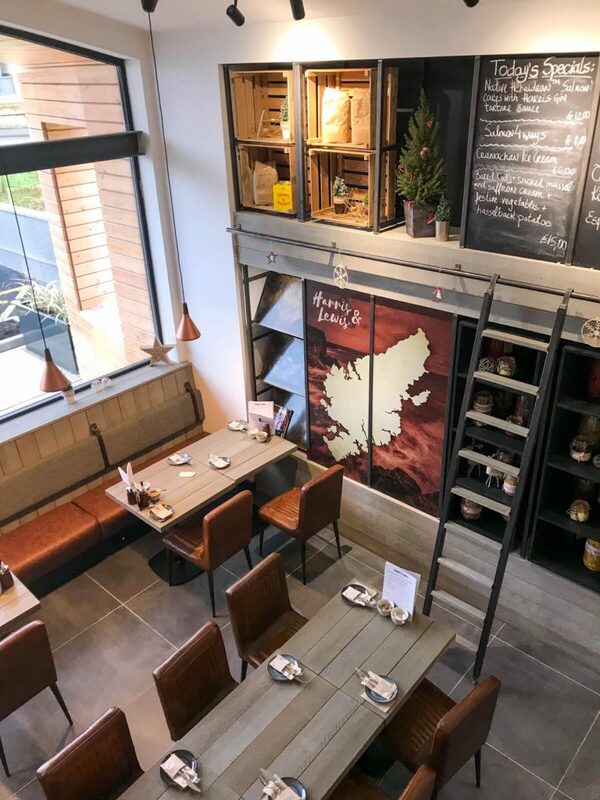 The Harris and Lewis Smokehouse in Stornoway is the latest culinary delight to hit The Outer Hebrides. 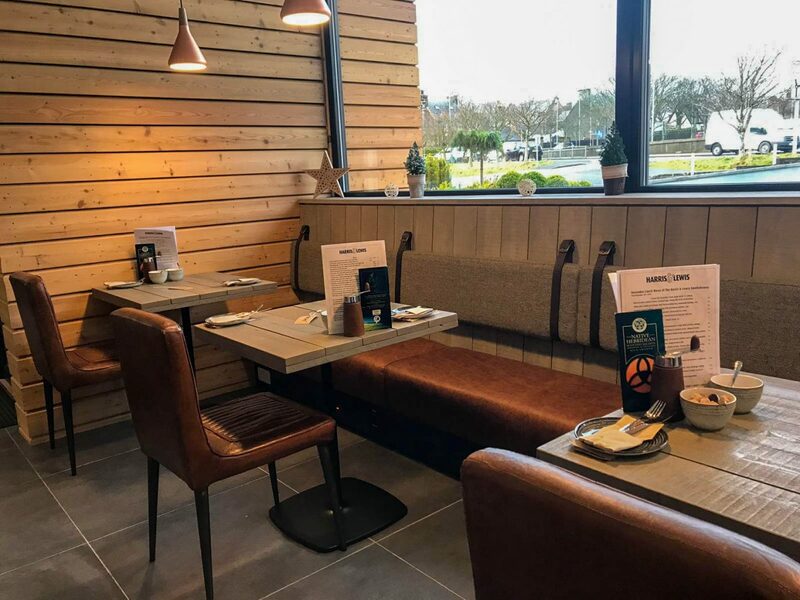 Serving breakfast, brunch, lunch and alcoholic drinks (with the option of hot drinks and cakes on the side), the Harris and Lewis Smokehouse is bringing a little bit of city cool to the Isle of Lewis. 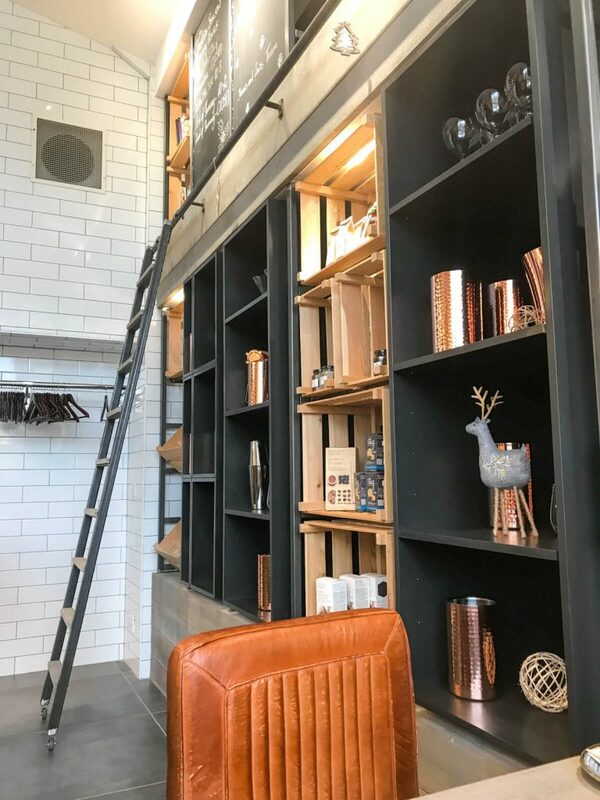 The interior is beautifully decorated throughout and thankfully they have not fallen into the trap of attempting to keep up with the latest trends, so the decor is somewhat timeless with tweed and leather seating, and some lovely wall shelving. 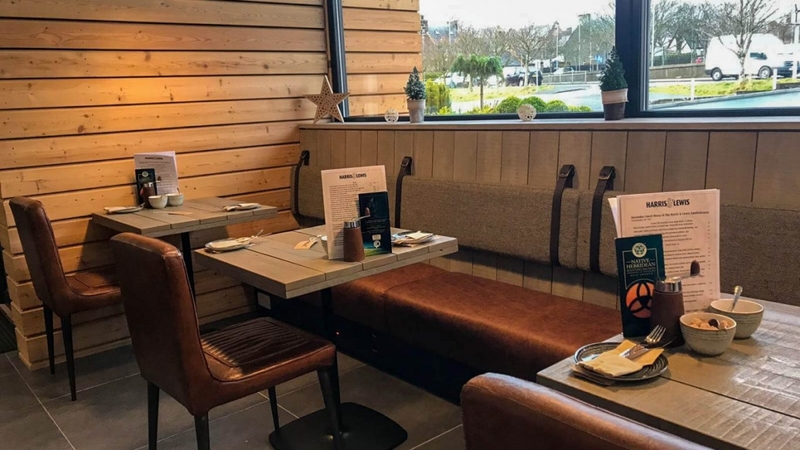 The menu places a strong emphasis on using fresh local produce and is quite fish heavy, whether it be smoked salmon, haddock or fresh hand-dived scallops. I love fish so that is all good with me but I know it’s not for everyone, Peter included, so fear not, there are fish free (and vegan/vegetarian) options available. During our two weeks in Stornoway, we visited the Harris and Lewis Smokehouse just once, for coffee and cake. We were too early for lunch and too late for brunch, we could have waited the half hour for lunch to start but we settled on having something quick to share with the intention of returning another day. I believe that the cakes change regularly as they are baked in house so you may not see these listed on the menu but they were sitting up by the counter, so make sure to head in that direction when visiting. And make sure to check out their specials board for seasonal drinks and daily offers! We found the pricing to be very reasonable, as I said, we only had coffee and cake (approx £2.50 each for coffee) but from looking at the menu prices overall I think that they are very fair, bearing in mind that there is a lot of fresh produce used. We chose the banana cake and ordered a coffee each. 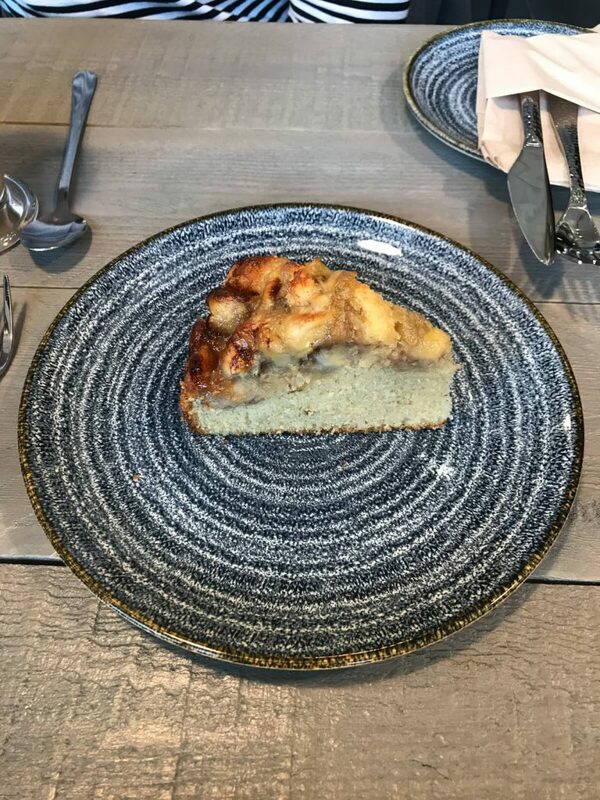 The banana cake was lovely, there was no banana through the sponge, instead of having the cooked banana lie on the top of the cake which is different to how we normally see it served but it was a very welcome change. It tasted great, as did the coffee so no complaints here. We did attempt to visit the Harris and Lewis Smokehouse a second time, for lunch, but it was busy/fully booked and personally, I think that’s great. Not what you expected me to say? Well, we didn’t book in advance and we visited on the off chance, so that’s our fault (if there is fault to be had) but I think it’s brilliant that there is such a buzz around this place and although we were disappointed that we didn’t get to have a meal, we really should take the time to celebrate new success and will know to book in advance next time. I think the island has been waiting for somewhere like this and I am glad to see a new business thriving. Still, I want to give you an honest opinion, as always, and I could skirt past any negatives and keep this post fluffy and light but there is something that’s niggling at me. Customer service. Customer service is so important. We’re not here to be personal, it’s a new business and we can all appreciate teething problems. It would be a stressful time, right? I can only imagine. The majority of our interactions with the staff were positive, a little slow but again, it’s a new business and to be expected. However, on both occasions, we encountered, directly and indirectly, some rude service. Unfortunately, through reading further reviews of the Harris and Lewis Smokehouse online, I see that we are not the only ones to have witnessed or experienced this. I really hope that this is something that will be addressed and worked on by management, and it wouldn’t put me off returning but in the age of social media, you never know who is taking note and often those first impressions count. 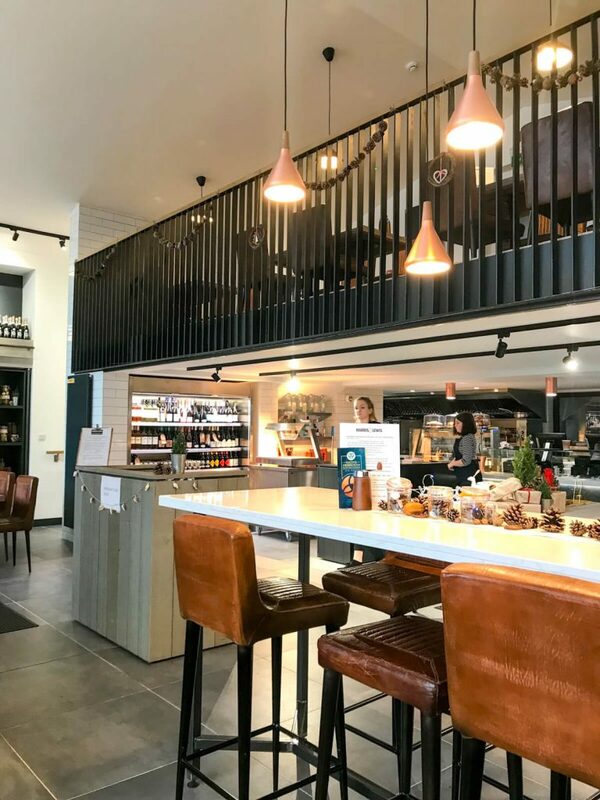 Despite that slightly disappointing experience, I would still urge you to give the Harris and Lewis Smokehouse a visit and hope that these minor setbacks improve with experience!